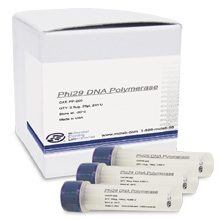 Phi29 DNA Polymerase is a replicative polymerase. This enzyme has assist DNA replication, phi29 DNA Polymerase has the highest processivity and strand displacement activity among known DNA polymerases - more than 70 kb long DNA stretches can be synthesized. Phi29 DNA Polymerase is responsible for the replication of the Bacillus Subtilis phage phi29(1). The enzyme is a highly processive DNA polymerase (up to 70,000 base insertions per binding event) with a powerful strand displacement activity(2) and a 3' -> 5' proofreading exonuclease function(3). A recombinant E. coli strain carrying the phi29 DNA Polymerase gene from bacteriophage phi29. 1 unit is defined as the amount of polymerase required to convert 0.5 pmol of dTTP into acid insoluble material in 10 minutes at 30°C. 1. Blanco, L. and Salas, M. (1984) Proc. Natl. Acad. Sci. USA, 81, 5325-5329. 2. Blanco, L. et al. (1989) J. Biol. Chem., 264, 8935-8940. 3. Garmendia, C. et al. (1992) J. Biol. Chem., 267, 2594-2599.